Do you have confidence in your smile? Let’s face it: some of us have a weakness for soft drinks, coffee, and other drinks that can stain and negatively affect our teeth. Smoking and certain acidic foods don’t help, and acid reflux only makes the problem worse. Gum disease, clenching and grinding one’s teeth at night, and various kinds of trauma also take quite a toll on the health and appearance of our mouths. Are you concerned how others will judge you based on your teeth and mouth? Life will always be complex, but restoring the condition of your teeth—a.k.a., your “dentition—shouldn’t be a nerve-wracking experience. Though individual procedures can help, a prosthodontist’s expertise can help provide the long-term solution for helping you reclaim a strong, healthy dentition and put some sparkle back in your smile. When prosthodontists speak of rehabilitation, they’re talking about a comprehensive repair of damage done to your teeth. 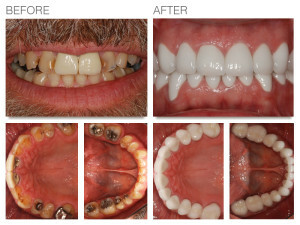 At East Tennessee Prosthodontics, we strive to offer patients the most reliable treatment options to help them restore and save their teeth, and this process may include collaboration with other dental specialists to formulate a single, comprehensive treatment plan to undo years’ worth of damage and bring back that attractive, and durable smile. Rehab may even include rebuilding most or all of the teeth in both upper and lower jaws. Yes, it’s possible! A skilled prosthodontist will lead the team in diagnosing and developing a program customized exclusively for you. That program will include the latest advances in crowns, fixed bridges, veneers, dental implants, gum disease treatments, grafting procedures, root canals, and whitening. Depending on your situation, the process may take six months or more to complete, but the team at East Tennessee Prosthodontics will be with you every step of the way. We want you to love the finished product. If you suffer from a worn-down bite, have broken or severely damaged teeth, need serious dental reconstruction, or simply want to learn more about what makes a prosthodontist special, then call East Tennessee Prosthodontics at 865-769-0886. After all, you should be confident in those pearly whites and what they do for you!